The Archbishop of Canterbury has requested that we ring in support of Notre Dame, Paris, this Thursday. Our ringing will start at 6pm. Please think of the people of Paris at this time. This coming Friday 1st February, there will be men in the churchyard replacing tiles on the roof. The churchyard will be closed for about 2 hours around lunchtime. This is to protect both the workmen and the public from any accident or mishap. Diana will be putting up “men at work” signs and will be around to redirect any visitors. 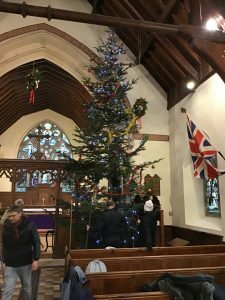 Many hands made light/lighter work of selecting, cutting , decorating and hoisting our Christmas tree into place this morning. What a morning weather wise, snow, just a few flakes, rain, rather a lot and bitingly cold wind. Pam Fuller provided hot drinks and food for the workers, who ranged from toddlers to elders of the Community. 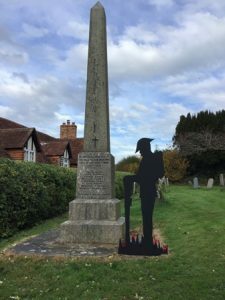 At 7pm on November 11th, Dallington villagers gathered at the Sugar Loaf Field for the lighting of the beacon to commemorate the 100th anniversary of the Armistice that ended the Great War. It was a mild dry night with little cloud and a setting crescent moon, allowing the stars and constellations to be seen just as they would have been on the 11th November 1918. We stood around our beacon which soon gave a good display of flames and sparks and we reflected on the sacrifices of so many men and women both military and civilian on all sides during that conflict. Other beacons and bonfires could be seen in the distance including Punnett’s Town, Burwash and Firle Beacon. Aircraft overhead would have seen many more as this was a national display of commemoration. It was supposed to be a war to end all war but sadly this was not to be. Hopefully on November 11th 2118 when Dallington villagers gather round the now ancient beacon to commemorate the 200th anniversary of World War 1 armistice, they will be living in a peaceful world where all differences are resolved by discussion and compromise; and they will look back with incredulity on the folly of our times!